We love coffee. Good coffee. DAMN FINE coffee. Our ongoing mission is to bring you the best coffee the country has to offer. In addition to fine espresso and drip from our pals and anchor roaster at Halfwit - we'll be featuring different roasters from around the country every month for our manual brews and retail beans. But coffee isn't the only thing we love. Of course there's Tea - and we've got some of the best available - courtesy of our pals at SpiritTea. We're also a fan of yummy treats - and we've got that covered. We get daily deliveries from Floriole Bakery as well as vegan donuts from Do Rite Donuts. The kids love it. We also feel it's important to note that we use organic ingredients whenever possible as well as offer a number of dairy-free options. Just an FYI - this menu is not an accurate depiction of our offering. 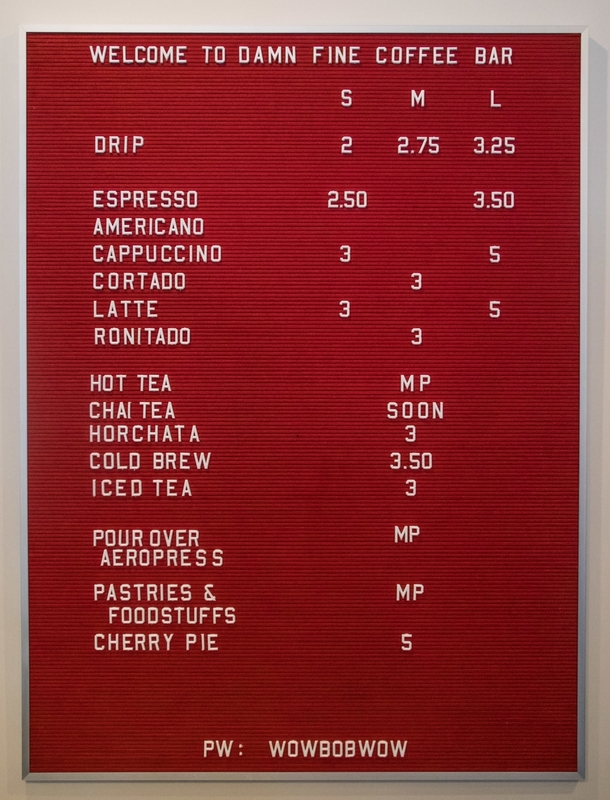 It's just a photo of our menu board. Every month we're going to feature unique roasters from around the country. We feel it's important to showcase products that Chicago coffee lovers would otherwise not be able to enjoy. We love food. We love the tension between art and science inherent in the creation of good food. We recognize that coffee is a seasonal fruit and that beans from different regions and climates should be treated differently. Finding an optimal roast profile for a given bean is often a labor intensive and time consuming process, but we believe that the only way to fully respect the intrinsic qualities of that bean is to tailor our roast to each lot. In so doing we believe we are also respecting the hard work and attention to detail of those preceding us in the production chain. At Roseline Coffee we will always source the highest quality and freshest ingredients. At the most fundamental level, roasting is a process of applying heat to convert proteins and enzymes into simple sugars. We aim to manipulate carefully and precisely this application of heat to bring out the most complex flavors and tactile experiences, leaving no trace or taste of the process itself. Rather than seeking to mask a coffee's given varietal, its terroir or processing, we work to highlight those properties, knowing they'll ultimately contribute to the aesthetic and enjoyment of the finished product. We're in the southwest region of Logan Square. Currently an oasis in this otherwise coffee desert. FOLLOW OUR PROGRESS AND MISHAPS AT THE SHOP!